Henry Ford was many things, an engineer, doting father, pacifist, businessman, eccentric, and a watchmaker. At an early age he became interested in watches and would fix them for people for fun, and eventually that led to a job as watchmaker. It was Ford’s inspiring passion for mechanics which ultimately led him to the development of the Model T – a car built for everyone. To keep cost down so it was indeed affordable for everyone, Ford became the first to use a production line. Over 110 years later the Ford Motor Company remains the largest family-controlled company in the world. The founding idea of a car built for everyone evolved to Ford owning five other luxury brands including, Mercury, Volvo, Land Rover, Aston Martin, and Jaguar. Mercury was discontinued and the other brands were sold, but Ford and Lincoln remain and they’re doing gangbuster business worldwide. For everyone that owns one of the earlier Ford platform vehicles listed below, we have good news. Spectre Performance makes a replacement air filter (HPR8956) that’s engineered to outperform run-of-the-mill replacement air filters. The HPR8956 replacement air filter uses a high quality, synthetic filter media that delivers increased air flow to your engine. More air means more thorough combustion, which translates to increased performance. 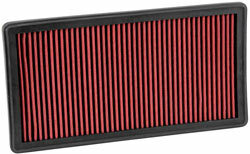 The HPR8956 high performance replacement air filter is designed to easily fit into your existing air box using ordinary tools. Mechanical skills aren’t needed. The pre-oiled and ready to install high performance replacement air filter also provides excellent engine protection. Spectre Performance air filters are designed for power and protection – make the switch today.